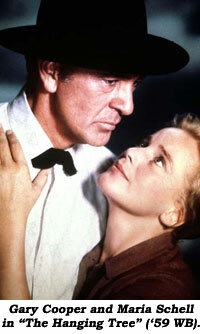 Will Hutchins remembers Gary Cooper, John Wayne and Maureen O'Hara. Howdy! In the late ‘50s I made a funny TV western written by Warren Douglas. Joe Sawyer played the bad guy. He was really a good guy, worked with everybody from John Ford to Abbott and Costello. I asked him what he did before showbiz. “Pro football,” he said. “The Bears? The Packers?” “No,” he said, “USC, Michigan, Penn State.” There was no TV. He moved from school to school, undetected, changing uniforms and names. He’d miss classes but not paychecks. He took a pay cut when he started acting. In the late ‘50s I was up for a part in a Gary Cooper western, “The Hanging Tree”. I didn’t get it, but I did get a table next to Coop in the commissary one lunch break. Table hoppers kept him busy ‘twixt bites. One asked him if he ever practiced his fastdraw with live ammo. “Nope.” He allowed as how, “A .45 makes a mighty big hole in your boot.” I’m glad I eavesdropped on Gary Cooper. A few years ago Babs and I tooled up the road apiece from Santa Fe to Durango for a western film fest. I was presented the Dobe Award—It stands tall next to my Golden Boot on our front room antique farm table. We met a couple of fine folks there, Mel and Angela from Brooklyn, all duded-up cowperson style. Mel told me a story he heard from Dobe Carey: While “Rio Grande” was being filmed on location John Ford was at the helm on a typical hot, grueling day. Wayne was doing a perfectly fine job o’ work, but Ford, as was his wont, blew up at the Duke in front of cast and crew, belittling him, embarrassing him no end—tearing him to shreds. Wayne was a major star by then, but Ford’s tirade wrecked him. He could barely breathe. Ford ranted and raved, “Blankety, blankety, blank! You’re not an actor. What the hell am I doing with you? You’re never any good. Ay Yi Yi Yi! You’ve ruined the whole movie. Ruined everything. All right! Shut down the set! I’m so upset by this bum! I wouldn’t even know where to put the camera. Break for lunch! I don’t care. We’re done for the day!” And John Ford stormed off. Wayne was shattered. Picnic tables were set up. Barbecue, hot dogs, hamburgers, coleslaw, potato salad. Maureen O’Hara sat next to a stunned Wayne. She was starving and more than ready to chow down. She was stuffing her face when Wayne, in a stupor, started talking to himself. “I can’t believe it. Why did he have to talk to me that way? I don’t know. I don’t deserve it. I’ve been in this business a long time. I paid my dues. Why did he talk to me that way? I didn’t do anything wrong. If I did, he should have told me. Why did he have to do that to me? I’m important…I…I.” Maureen spoke up, “Duke, oh Duke, could you pass the mustard, please?” Duke recovered, “Huh? Oh, yeah,” passing her the mustard. She slapped it on a hot dog and devoured it. Still in a daze Wayne went on, “It’s not like I’m just starting out—I’m important. I have to say it. I’m important to a picture. Just as important as he is these days. 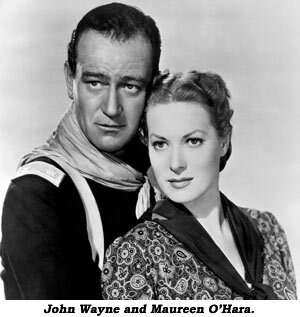 I think I should have gotten a fair shake, which I don’t think I got.” Maureen O’Hara stopped chewing, swallowed, and spoke, “Well, Duke, if you feel that way about it, why don’t you go to the old man and tell him so?” Wayne just sat there shaking his head. “Well, I—I—I,” And Maureen roared, “Well, then shut up!” NowI think I’ll shut up.